From the makers of Star Wars Insider comes The Best of Star Wars Insider, a collection of the very best features and interviews from the long-running magazine! 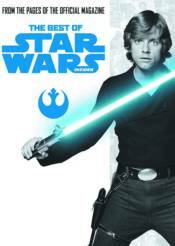 Included in this first volume are the very first Star Wars-related interviews given by Harrison Ford, Mark Hamill, and Carrie Fisher way back in 1976; an in-depth interview with Star Wars conceptual artist Ralph McQuarrie, and a rarely-seen transcript of George Lucas discussing the early days of the Star Wars spin-off books. This full-color volume, packed with incredible rare photos, is a must-have for all fans of the greatest space fantasy of them all-both young and old!